Happisburgh Mill Farm postmill stood to the south of Happisburgh at Whimpwell Green and had been built to replace an earlier mill on the same site; the post was dated 1773. The mill had a two storey roundhouse and a full width porch with a balcony. The mill was self wound by twin six bladed fantails mounted on a trolley attached to the tailpole. 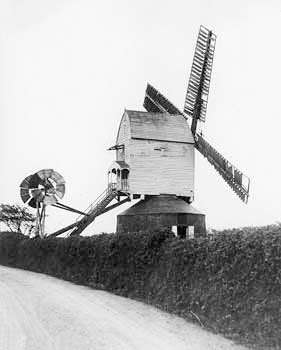 Four double shuttered sails, each with eight bays of three shutters were used to power two pairs of 4ft 4ins French burr stones, one pair of 4ft 4ins Peak stones and an oat crusher. The two pairs of French burr stones were in the breast to of the mill and would have been used for flour production from wheat. The pair of Peak stones for crushing barley etc for animal feed would have been in the tail of the mill and were probably driven directly from the rear face of a tail wheel on the windshaft without an intermediary gear, thus providing a left-handed drive. The mill was in the possession of the Frarey family, and before that in the Harvey family. I have a copy of the will of John Harvey of Ingham who farmed near Calthorpe Broad, leaving the mill at Happisburgh to his eldest son, Jonathan Harvey. This will was executed in February 1797. A very great storm from the North West Mr Harvey's mill was very much hurt by a ball of fire falling on it and burst out the side of the mill and hurt the man in the mill very much. On 13th May 1810, James Harvey, a farmer of Ingham, wrote a will leaving land and cottages to his brother John Harvey, the miller of Happisburgh. He also left land to his grandson, James, who was possibly the son of John Harvey and was under the age of 21. No wife or children were mentioned in the will. James Harvey snr was almost certainly the son of John Harvey snr and inherited the land and farm in 1797. I devise to John Ford, my beloved brother of Happisburgh, my copyhold house, and half acre more or less of land in the parish of Palling, Co. Nfk, (in the tenure of Robert Rutheram), also my cottages and 2 acres of Land more or less situate in the parish of Eccles (Next the Sea), Co. Nfk. £10.00 to James Lack of Lessingham, cordwainer. £5.00 each to the following. Charlotte wife of ........?........ Royall (or Moyall), of East Ruston, Labourer. sister Elizabeth Colman, (if alive). Thomas Frary the Younger of Happisburgh to purchase a suit of mourning to follow me to my grave. Will of James Ford, miller of Happisburgh. Written 11th November 1826. Proved at North Walsham 15th April 1829. And also all that POST WINDMILL driving three Pairs of Stones, with the Roundhouse & fixtures thereto. A lucrative Milling business has for many years been carried on & the Goodwill will be included. This Lot contains, Sites of Buildings included, 39a. 2r. 15p. of which 28a. 3r. 20p. or thereabouts are Copyhold. Fine certain, residue Freehold. Particulars of the Auctioneers, Knapton, North Walsham & of Mr. John Wilkinson, North Walsham, Vendors’ Solicitor. Lot 5. A Desirable FARM comprising an excellent Brick & Slate Messuage or Dwelling House which contains … with walled-in Flower & Kitchen Gardens & small Orchard & convenient Outbuildings. Also a Three-stall Riding Horse Stable & Coach house with Granary & Hayloft over. Also all that Post WINDMILL driving Two pairs of Stones, with the Round House thereto, which has for many years past been doing a lucrative business. The Farm Buildings & Premises comprise … Paddock & several Inclosures of superior Arable LAND. 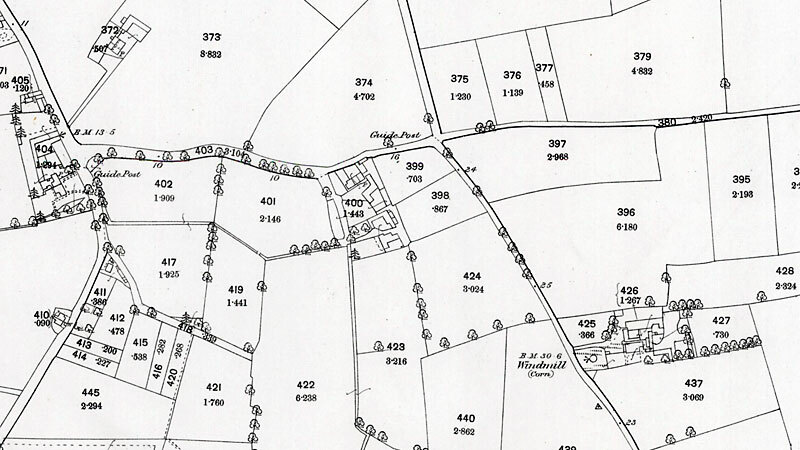 This Lot contains, sites of Buildings included, 39a. 2r. 15p. of which 28a. 3r. 20p. or thereabouts are Copyhold, Fine Certain, residue Freehold. Further Particulars of the Auctioneers, Knapton, North Walsham & of Mr. John Wilkinson, North Walsham, Vendors’ Solicitor. Very rarely a post mill has had twin fantails side-by-side, so as to catch a light breeze more readily. 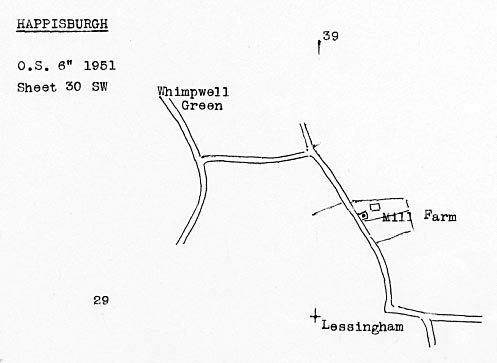 There were distinct physical similiarities between Happisburgh mill and Catfield_Mill_Road_postmill that had been built by John Bowen c. 1770 - 1774. In 1976 Harry Apling noted that one of the Peak stones was being used as the front doorstep of the Mill house.